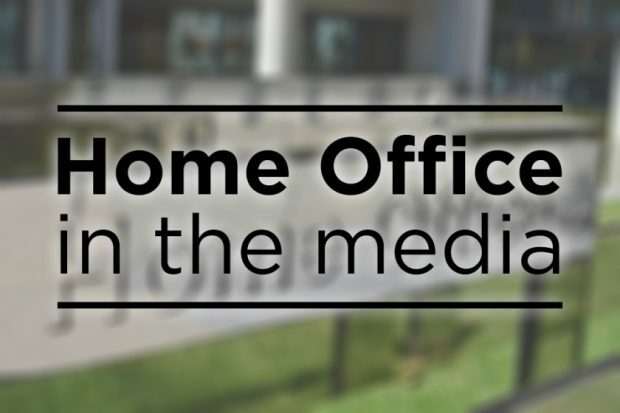 Today’s Home Office related stories include a report on drinking at airports and an increase in the use of the drug known as 'monkey dust'. The Times, Telegraph, Mail, Sun and Mirror all cover the report by the Institute of Alcohol Studies and the European Alcohol Policy Alliance on drunk passengers at airports and on flights. The report found that two thirds of British adults who travel by air (60%) have encountered drunk passengers. The report follows a 2017 House of Lords Committee recommendation that the UK Government extend the Licensing Act to airside premises. A statement from the Home Office on the issue is below. Everyone should be able to enjoy a safe journey through UK airports without disruption. Most UK air passengers behave responsibly, but any disruptive or drunk behaviour is entirely unacceptable. There are already tough penalties for drunkenness on an aircraft — you can be imprisoned for up to two years or given an unlimited fine. Pilots also have the power to remove passengers from the plane if they are drunk and the safety of the aircraft or its passengers is threatened. The Home Office will shortly issue a Call for Evidence to assess the impact an extension of the Licensing Act to airside premises at airports in England and Wales could have on reducing alcohol-related disruptive passenger behaviour. The Telegraph reports that police are warning that an increase in the drug called ‘monkey dust’ is causing people to jump off buildings. The paper says the class B drug costs just £2 a bag and has led to people jumping off roofs and running into busy traffic. Among other things, the drug can make people feel incredibly strong and lowers their perception of pain. We are committed to preventing drug use in our communities and support people through treatment and recovery. Our Drug Strategy sets out a balanced approach which brings together police, health, community and global partners to tackle the illicit drug trade, protect the most vulnerable and help those with a drug dependency to recover and turn their lives around.